The offices of Dr. Parsa Mohebi have a new weapon in the fight against hair loss. They are one of the few practices in the Los Angeles area with the new ARTAS Robotic System. This doctor assisted robotic arm allows for the grafting of follicular hair units automatically with pinpoint precision, resulting in a final appearance that is unmatched by anything else out on the market. Using the FUE method, the ARTAS Robotic System employs high resolution cameras and a computer to calculate the dynamics of each follicular unit. The resulting information is then processed by the ARTAS’s sophisticated algorithm, which turns the data into coordinates, and proceeds to extract the hairs quickly and accurately. The advantages of the machine are twofold. By minimizing over harvesting and a prolonged discomfort, this allows for the doctor to create a natural look with a methodical procedural execution, benefitting both the patient and surgeon alike. The robots that were used for hair transplantations, prior to the ARTAS Robotic System’s innovative techniques, were cumbersome and even more time consuming than manual extractions. The older machines often could not match the time expenditure or results that were possible by doctors alone–until now. Although, a talented surgeon is still needed to perform these tasks even with the robotic system, the procedure is now lessened by two hours and takes approximately 6-8 hours. 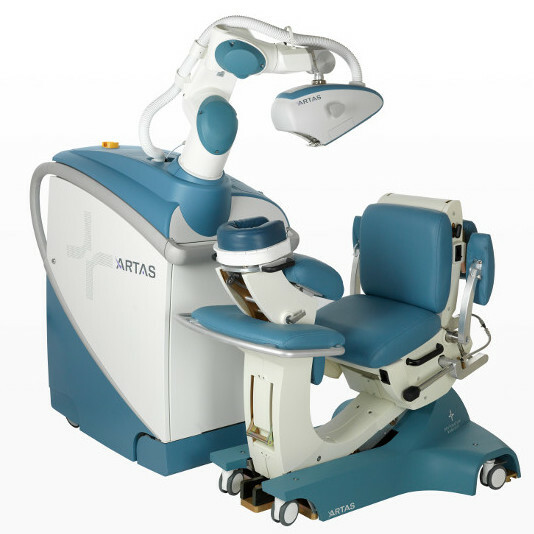 With the ARTAS robot, the patient is comfortable and fully supported by the machines seated position. The incisions are minimal in diameter and similar to those made by the doctor himself. By addressing the major drawbacks and concerns that were prior issues, the ARTAS Robotic System, with Dr. Mohebi at its helm, can extend his unparalleled expertise at a higher rate of speed and with incredible results. As former chairman of the FUE Research Committee and creator of several methods in modern hair restoration, Dr. Mohebi, along with his incredible staff, provide the most advanced techniques in the industry. Dr. Mohebi prides himself on advancing new research and developing the latest technology to improve the caliber of hair restoration. The overall goal at his practice is to restore patient’s self-esteem through the use of quality hair restoration techniques.